We’re only 16 games into the season and the buzz surrounding this weekend is that usually reserved for September/October baseball. The Rangers, Islanders and Nets might be in the playoffs – but the subway series is the talk of the town. When the schedule was first released I was disappointed to see the first part of the subway series would be taking place in April. I felt it was too early in the year and would be lacking any real excitement during this normally dull period in the season. Luckily I could not have been more wrong. 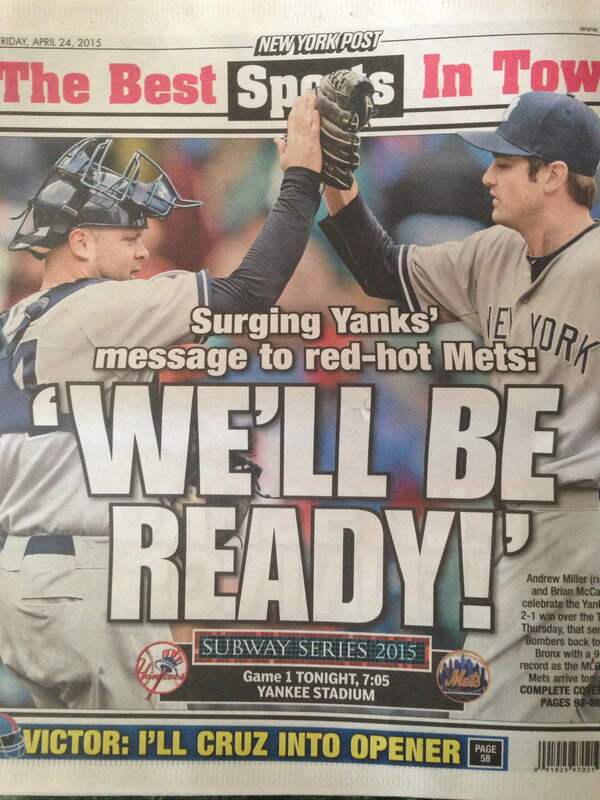 We might not have kicked the cold weather just yet in New York but both of these teams are red-hot. The Mets (13-3) come into this series as the hottest team in baseball – riding an 11-game winning streak. Their hot start has already given the Mets a 4.5 game lead in the NL East. Despite players dropping like flies due to injury (and suspension) the team has maintained this football like mentality as “next man up” seems to be their mantra. Terry Collins has his ball club playing with a type of grit and resilience that hasn’t been seen in Queens in years. The fan base has responded in a big way to this early success. Attendance is soaring and Citi Field, dare I say it, is beginning to rock like Shea. Maybe not quite on that level, but it’s a noticeable atmosphere change. Every night a different player seems steps up and comes through with a key walk, sacrifice fly, strong start, clutch hit or defensive web gem on the way to a win. It has been a complete team effort early on for the Metsies. After getting off to a 3-6 start it appeared the Yankees (9-7) were in an early season tailspin. Things quickly turned around as the Yanks have since won 6 of their last 7 and now sit tied for first place in the AL East. There were questions swirling around some of this teams veteran players and what, if any, they had left in the tank. Mark Teixeira and A-ROD have been a blast from the past as each are producing at a high level. Chris Young, who was viewed as the team’s fourth or fifth outfield option, is among the hottest hitters in the game and has forced manager Joe Girardi’s hand for more playing time. The tag team of Dellin Betances and Andrew Miller has been as good as advertised in the back-end of the bullpen. In just a week the Yankees have changed their outlook from bleak to optimistic in what appears to be a wide open AL East. In years past this has been a no-win situation for the Yankees. They have long been the kings of this city and would never gain any real advantage from taking a series from the Mets. 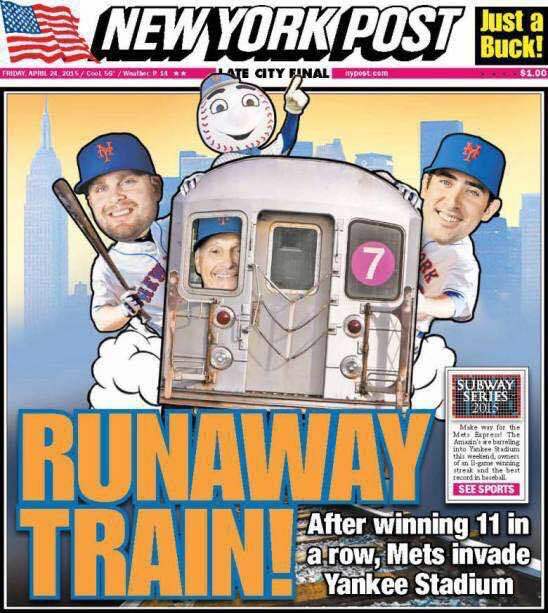 Even when the Mets have won this series in recent years it has garnered no real significance. Sure, it’s nice to beat the Yankees but no one really cares when you’re playing meaningless games by the middle of August. This year feels different. The Mets, and their fans, have been quite vocal in pronouncing 2015 as the year they take New York back. This is the first time that I can ever remember the Yankees coming into the subway series with a little chip on their shoulder. I have a REALLY hard time saying any team with a payroll well north of $200 million is ever an underdog, but it sure feels that way. For the Mets, if they really want to surpass the Yankees as the toast of the town – it starts by sending a message this weekend. Hey Tim, great blog! Just featured you at http://MLB.com/blogs – spread the word! Thanks, Mark! Appreciate the love.